Whenever you are doing renovations to your home, research is the best resource at your disposal. Going through the artificial grass installation process is one of the most joyful experiences you can have, however, there are a few obstacles that you may run into. Although these problems are typically minor, if you are not prepared to address them they can become major. Artificial grass installation does not take long but there are some obstacles that installers have to overcome. When an artificial grass installer first does their initial estimated quote, there are some things that they can’t account for until the installation process begins. For example, artificial grass can be installed around trees, rocks, under bushes, on hillsides, under yard furniture, and much more. Because of this, during the installation process, some reconstruction may have to take place. For the installers to do a professional job, they may have to remove things that are in the way to the artificial grass being installed properly. Be prepared for the installers to have to make adjustments to their installation strategy. Every home and yard are different. These adjustments are ultimately in your best interest and will make your yard look great and last longer. Where does rainwater go when it lands on artificial grass? It goes through the artificial grass and releases into the soil. Regular grass has the same process but the grass also absurd water. Because artificial grass does not absurd water, you have to be careful when choosing what drainage technology is built into your artificial grass. Look for artificial grass that has a permeable backing to ensure suitable drainage. Artificial grass with holes burned or drilled into the backing does not drain effectively and often causes urine odor to develop over time. This will be a complete nightmare if you have pets. Save yourself the headaches and be sure to thoroughly check the drainage technology of your artificial grass. Remember that research and preparation are the two most important things you can do when it comes to artificial grass installation. There are a lot of different grass types and purposes. Compare and contrast the different types and find out which will be best for you. You don't want to be the person who is unhappy with your artificial grass a year later because you realize there was a different type that fit your lifestyle better. How do I currently utilize my yard? What do I plan to do in the future with my yard? How will my kids or pets affect my yard? These are a few questions that can get your brain thinking towards what type of artificial grass you should buy for your home. The beauty of artificial grass is that you can always change or enhance it as time passes so, don't stress over the decision. 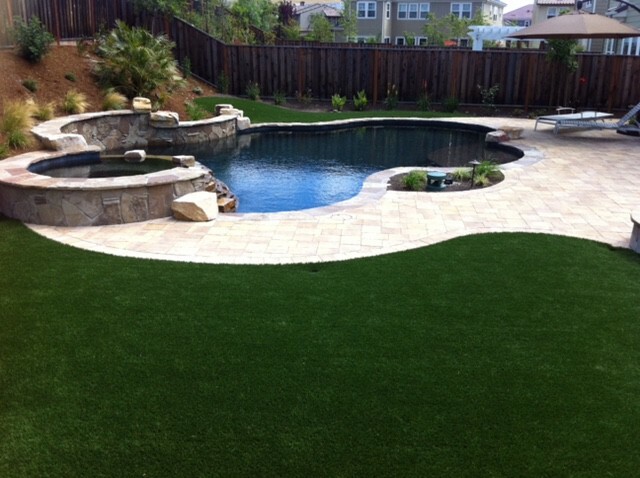 Have fun picking your artificial grass and dive into the world of different colors and styles. Many people install artificial grass, however, few people are professionals. Hiring an artificial grass installer can be a tricky thing because most customers have very little knowledge about the artificial grass installation process. Furthermore, you should ask the contractor to explain their installation process from the beginning to end. Make sure you feel comfortable with their explanation. Any professional artificial grass installer should have no problem explaining how their company installs artificial grass. One of the biggest mistakes that first time artificial grass owners make is assuming their job will be like every other job that artificial grass installers have done. Every job is vastly different because there are so many variables to each house. These are important things to take into consideration because it helps the communication between you and your contractor go smoothly. A great rule of thumb is to over-communicate when you are getting your yard installed. Your new yard will be an addition to your home that will last at least the next 20 years and you want to make sure it is done right. You should feel comfortable, relax, and joyful for the amazing addition you’re making to your home. Every yard is unique, so make your artificial grass experience on for the lifetimes!